In my practice of lutherie, I subscribe to the credo not that a guitar is more than the sum of its parts, but that there are no parts, only the guitar in and of itself. So while Gespalt may be made of bolted-together bits, it is and cannot be anything other than itself. The body has a resonant core of Alaskan Yellow Cedar, capped with plates of locally-sourced spalted maple. This is complimented by a vibrant and unique neck, sculpted from a single perfect piece of Kabo Rosewood. The neck blank rings like a marimba bar; it is also so dense, stiff, and stable that no truss rod is needed. The stainless steel frets are Plek-processed too, so the action and playability are as absolutely perfect as the laws of physics allow. 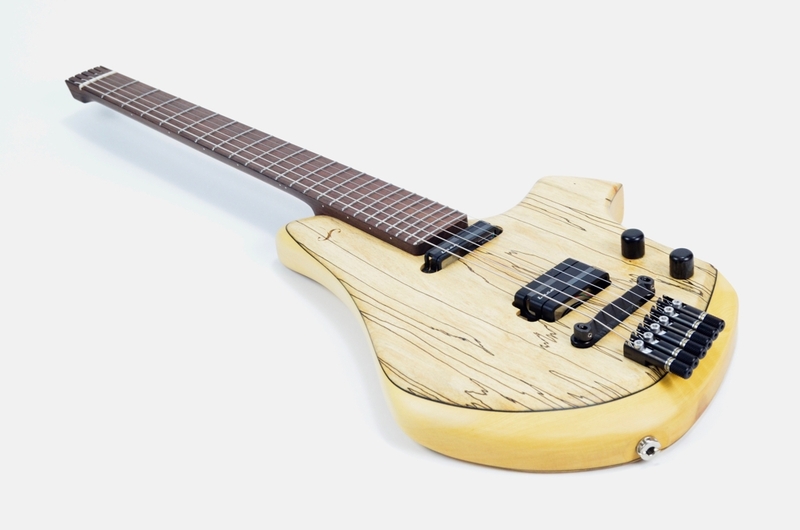 It’s equipped with two Lace Alumitone pickups. Rather than a master volume and master tone, the timbre and amplitude are infinitely adjustable via two separate volume controls. In this way any variation between clarity, grit, depth, warmth, and bite can be dialled in. 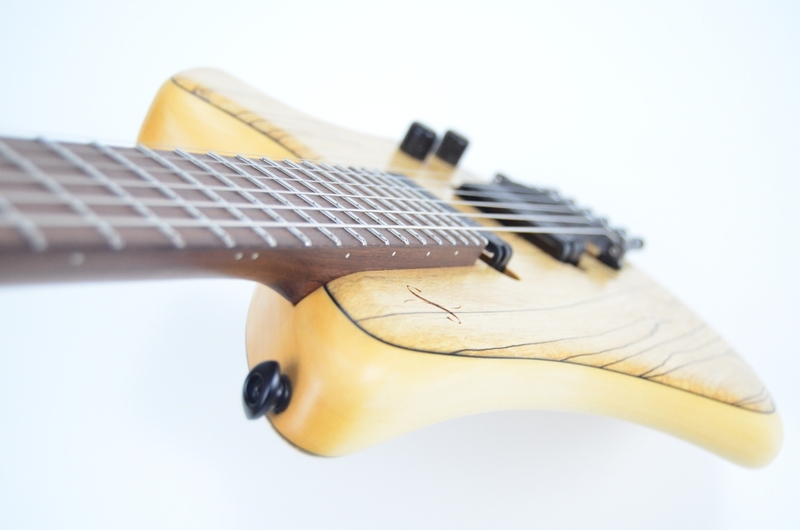 The bridge and tuners represent the state of the art in both cases. 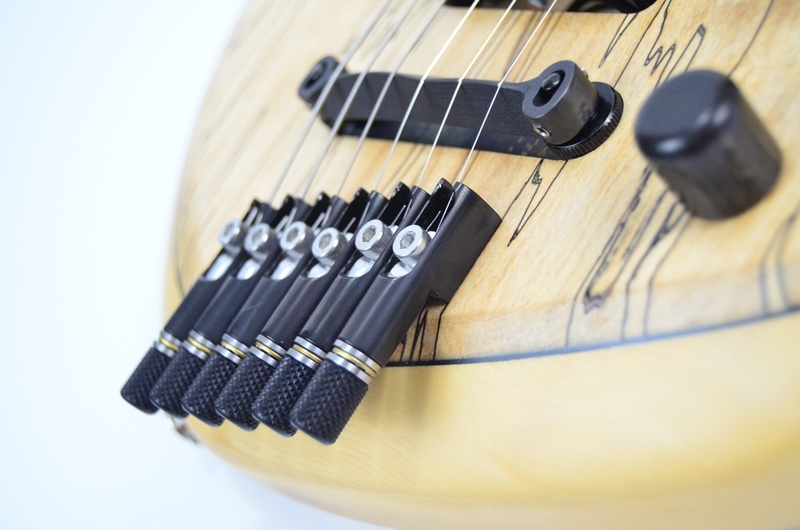 The bridge is made of 3-d printed metal, while the tuners are the machined version of my Wrap-Lock concept, with ball-bearing thrust plates for easy operation and long life. Headless guitar are rapidly becoming popular- it seems only fair to be able to offer them without compromises.